The emerald ash borer has officially arrived in New Hampshire. 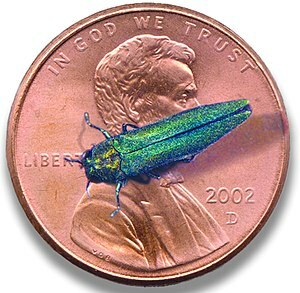 The larva of this bright metallic green insect has killed millions of ash trees across the country since being spotted in Michigan in 2002. 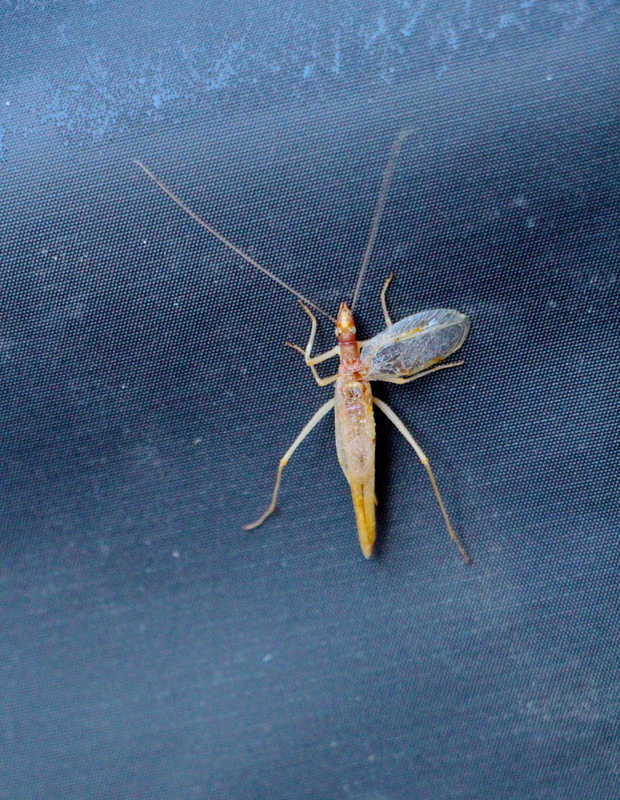 The insect hails from China and it wiped out Michigan ash trees before moving south into other states. Officials knew it was just a matter of time before it would invade New Hampshire. My son and his family are the owners of a wooded property surrounding their new home in Ohio. Visiting them this summer, he sadly pointed out the ash trees that were either dead or in deep decline from the emerald ash borer. These trees didn’t stand a chance against the invader and last weekend he removed 11 ash trees. Two years ago at my daughter’s home in Portsmouth NH, I noticed several ash trees with declining canopies on neighboring properties and I told her she should check them for signs of borers. I don’t believe any signs of the borer were evident to her and the trees may have been stressed from other causes, perhaps a previous drought. 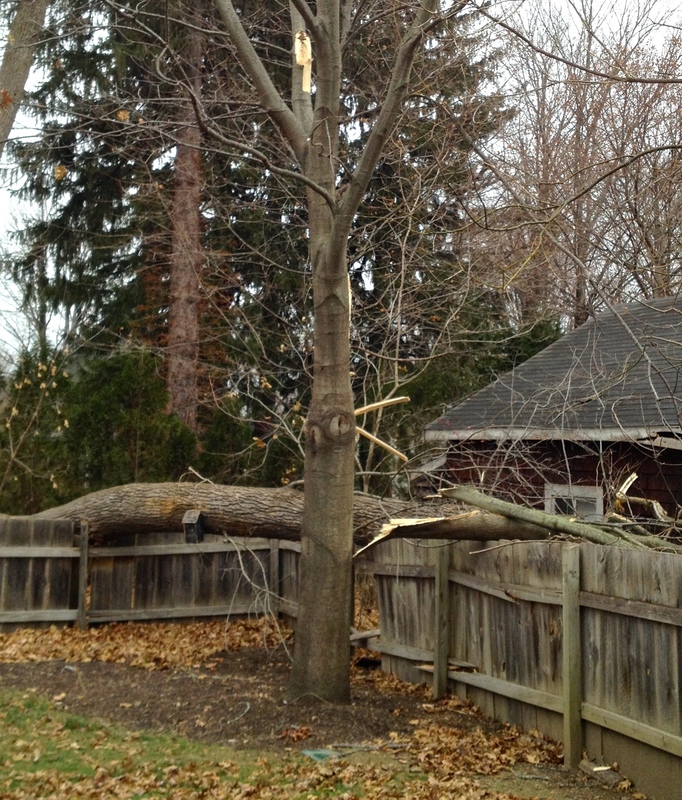 They were so stressed that in a recent windstorm, one tree fell across the fence into her yard… now a rental property they own. She says I must wait for the final verdict from the tree experts to learn what caused the ash to fall. Or if I’m pushy enough, she might let me visit and examine the bark myself. Sadly, the ash is such a staple of urban life found in landscapes and lining city streets. They are beautiful and majestic trees that replaced the elm trees after Dutch Elm Disease wiped them out. The adult borer eats only the leaves of the ash but the female lays from 60 – 90 eggs in crevices on the bark. The larvae live beneath the bark for about two years before adulthood, becoming pupae in the inner bark the final winter… where a multitude of larvae and pupae interfere with the transport of water and nutrients to the tree’s canopy. In the spring, the insects chew their way out and the cycle repeats. It’s just beginning in New Hampshire and precautions are being taken. Quarantines on firewood is the first step. Click here to learn about ash trees and exciting new biological steps being taken to find an enemy of the borer. Chemicals have become more effective in treating early infestations in larger trees, applied either by companies or the homeowners. 12-11-2013 Update: The Emerald Ash Borer has now been detected in the town of North Andover MA. Click on the blog IPM of New Hampshire for more information. As we sat on the deck on warm evenings in late summer, we were serenaded loudly by a certain insect I could not quite identify. It was not the chirping field crickets so commonly heard in Virginia and it didn’t quite sound like the call of katydids.This buzzing insect song was loud and long. I searched in the direction of the call with a flashlight but it was well-camouflaged in dense foliage. It took me a few weeks to discover one of these well-hidden insects out in the open during the day. I don’t think I’d ever seen this insect. It’s a tree cricket… the two-spotted tree cricket (Neoxabea bipunctata), one of many varieties of nocturnal tree crickets around the world. 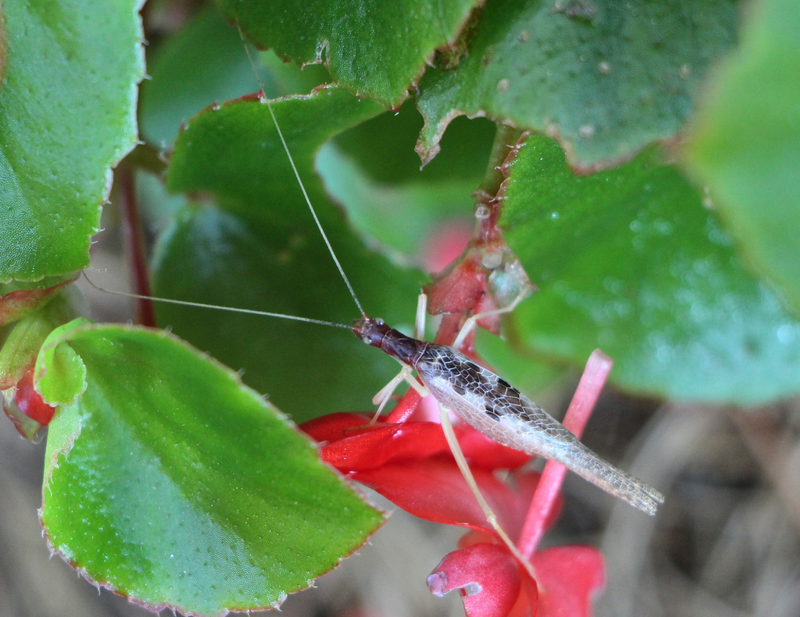 The first one I found, a female (below) with two identifying spots on her back, sat on a begonia leaf. The male, the vocal cricket who serenaded us so sweetly, I only discovered recently. It is interesting how the tiny male can project such a loud song. He chews a hole in the underside of a leaf, raises his wings at a 90 degree angle over the hole, and chirps away. The hole and the wings amplify his song like a megaphone. How cool is that? Here is a male that must have fallen from above with one of his wings askew. The circular spot between his wings is called the ‘honey spot.’ The female will dine on gland secretions during mating. I believe these must be fairly common crickets around these parts. I do feel lucky to be a part of their habitat. To read more about these crickets and see how the male sings through a leaf, click HERE. Yesterday, I saw a large black and white beetle with bull’s-eye eyes. It clicked and fell over dead. What are they called? It was black spotted with white. I thought it was dead and kicked it off the deck. Are they friend or foe? Well, Felicity, I’m fairly certain you saw a click beetle. There are hundreds of different species in North America. All of the species have a common behavior which gives them their name. When on their backs or when threatened by a predator, they all snap their heads with an audible “click” with such force that they are launched into the air, either landing upright, at a distance from trouble or they fly away during the launch. The click beetles that I commonly see are smaller, solid black or grey, nocturnal and attracted to light. 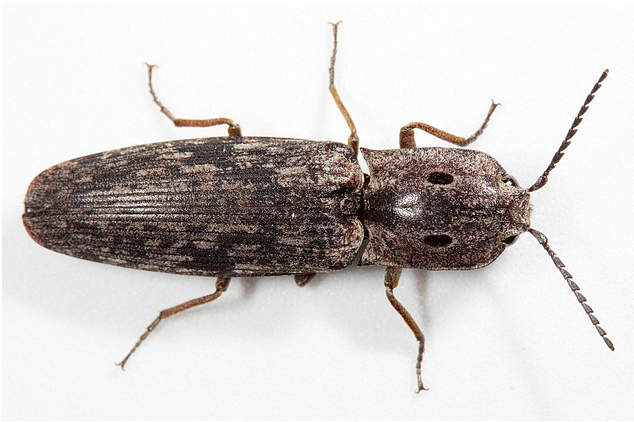 When I turn on an outdoor light, among the moths and a variety of beetles is the click beetle, flying around the light or resting on the wall in the glow of the bulb. The click beetle is one I cannot resist picking up between my thumb and index finger with its head exposed. It bends its head back, hesitates a split second, then forcefully snaps it forward. With each snap, it inches slowly from my grip finally catapulting into the darkness of the night. What a neat insect! 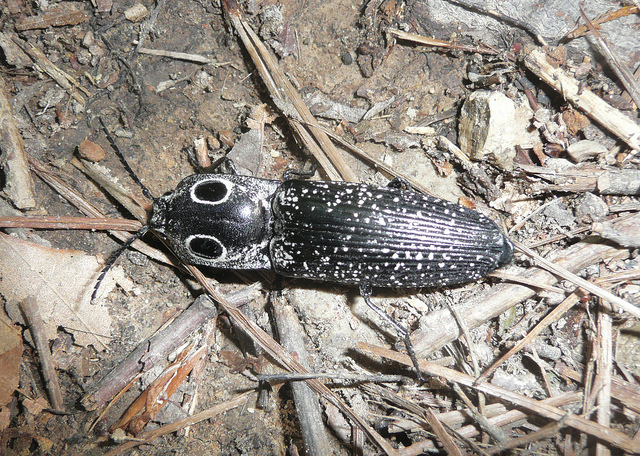 The click beetle that Felicity saw sounds like either the Eyed Elater or Eyed Click Beetle, one that can grow to 2″ long or she saw the Blind Click Beetle, a smaller insect with smaller eyes. The eyes of both are false. They have evolved to frighten off predators. The real eyes are small and are located closer to the insect’s antenna. The larvae of the Eyed Click Beetle, Alanus oculatus and Blind Click Beetle, Alaus myops, live in damp decaying matter such as rotting logs or under a blanket of decaying leaves. They can spend years in this stage as predators of insect larvae, including noxious insect larvae like wood-borers. In the adult form, they feed sparingly on nectar and juices from plants. In our part of the country we see more of the Alanus myops, the smaller Blind Click Beetle. So Felicity…. this is a friend, not a foe. It does not bite. It does not sting. You can pick it up without harm. You can watch it entertain you with acrobatic tricks. You may also see it playing possum fooling you into thinking it is dead… and kicking it off your deck to freedom. Caterpillars of all shapes and sizes, both moths and butterflies, are invading areas of the garden at this time of year. Some, like the black swallowtail caterpillar, I welcome; others are pests, like the Eastern tent caterpillar, and then there are a few that interest me, like the Redbud Leaffolder. 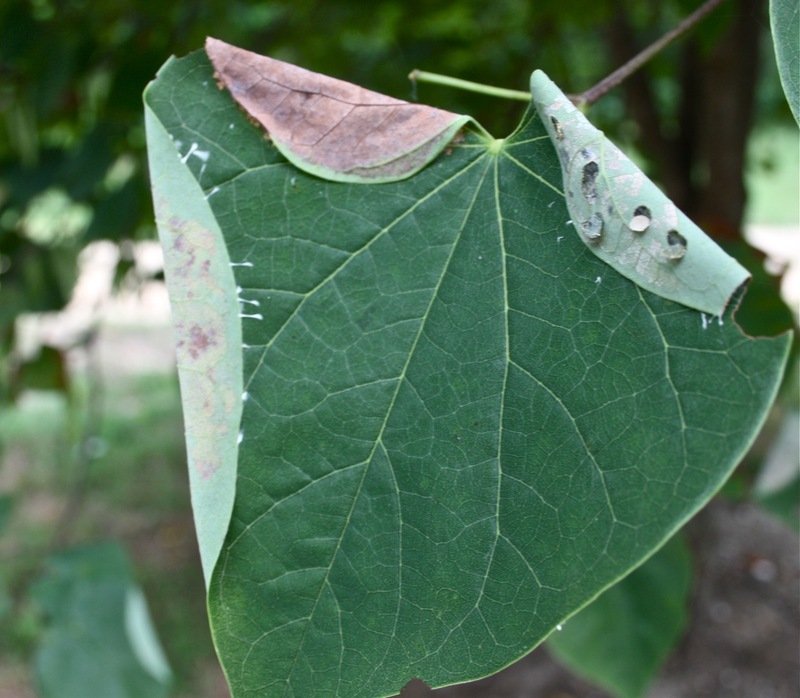 A tiny moth caterpillar, the Redbud Leaffolder (Fascista cercerisella), has turned some of the tree’s lovely heart shaped leaves into a patchwork quilt by folding or rolling the leaves. 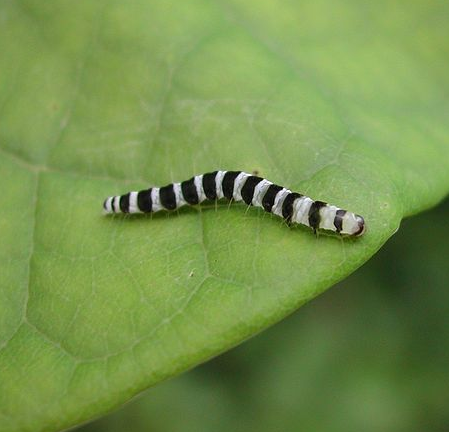 These black/white striped caterpillars pull a corner of the leaf over and ‘stitch’ the edges together with silk thread while they consume the leaf from the inside. I have opened some of the leaves to have a peek inside. I found several caterpillars in each fold and I was met with a flurry of movement. The caterpillars twist and jump, eventually falling to the ground as an escape. 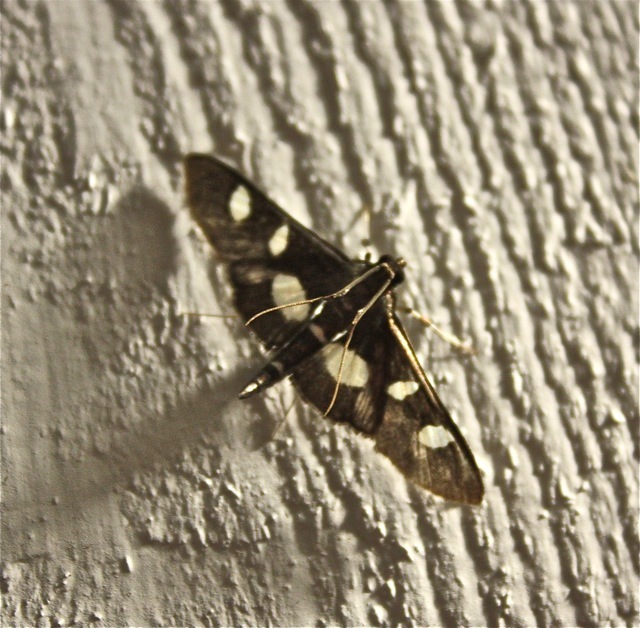 The adult is a teeny black moth with white spots. I have read that that these common moths breed twice a summer. I would not describe our tree as infested and I’m not ready to use pesticides. I’m watching and waiting. If I sense a problem, I’ll first try picking the leaf and stepping on it to squish the inhabitants. Pesticides will be the last option and it would have to be ruinous for the redbud before I take that final step. I stumbled upon my second Red Velvet Ant/Cow Killer of the summer. Recent storms dislodged a hummingbird feeder and the spilled sugar-water fanned out across a wide area. In the middle of the pattern of nectar were tachinind flies, yellow jackets, a multitude of ants and one solitary Red Velvet Ant. Thinking she would quickly scurry away, mister gardener rushed my camera to me. But we were mistaken. This gal wasn’t going anywhere. She was covered in the sticky sugary solution with bits of sand and debris stuck everywhere to her body, a comical sight. When I moved, she would dash under a leaf but she emerged seconds later and continued to wade into the pools of nectar, consuming as she strolled. If I leaned too close, she would tilt her head sideways to look at me and raise her abdomen in a threatening way. Around and around she circled, avoiding other insects as she gorged on puddles of hummingbird nectar, occasionally stopping to clean her antennae. 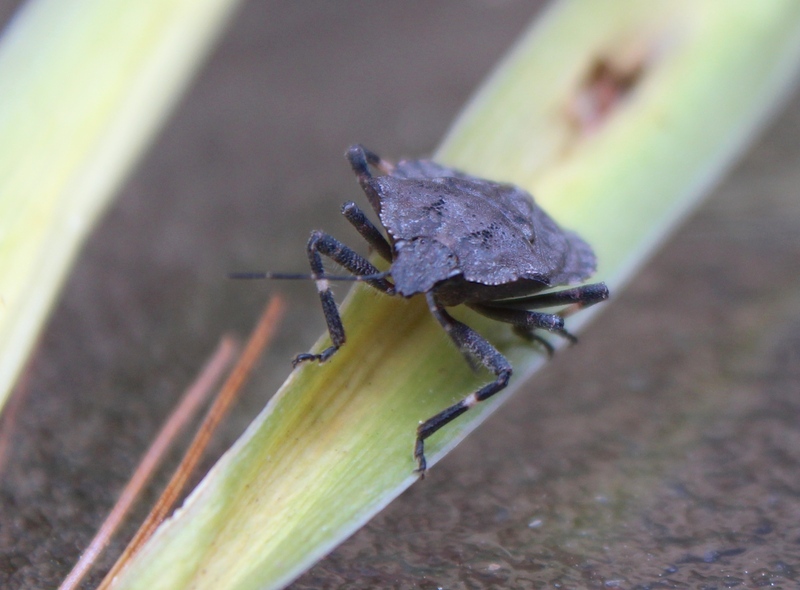 A Virginia Tech entomologist recently answered my questions about the insect. 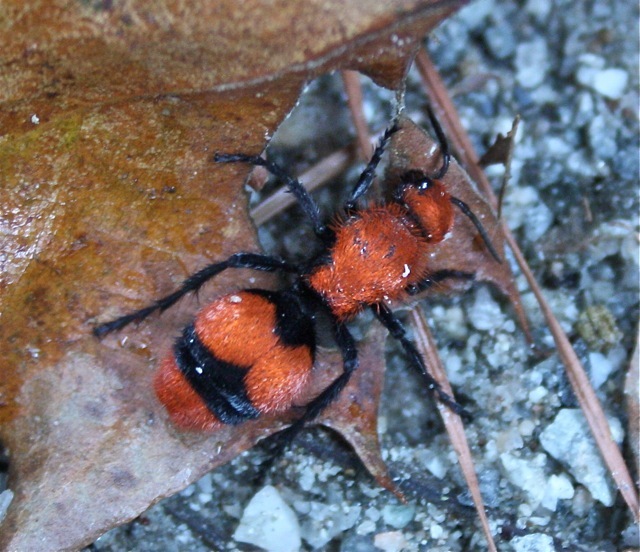 After a previous post about the Red Velvet Ant in our Virginia gardens, comments came from Delaware to Georgia, Tennessee and Maryland questioning the increased presence of this wasp. 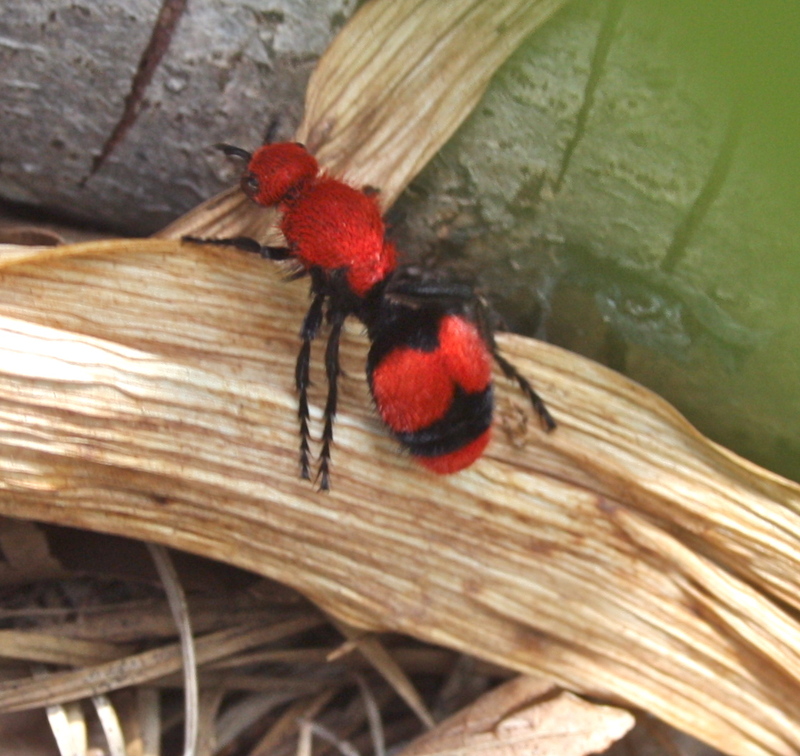 My 2-part question to the entomologist: “Why are there more sightings of the Red Velvet Ant/Cow Killer wasp and are they common in northern states, like Delaware?” His two word answer: “Global Warming.” He added that the Red Velvet Ant is a tropical insect and more common to Texas. In recent years, we have not experienced the long hard winter freezes that would kill the insect so their territories are expanding. 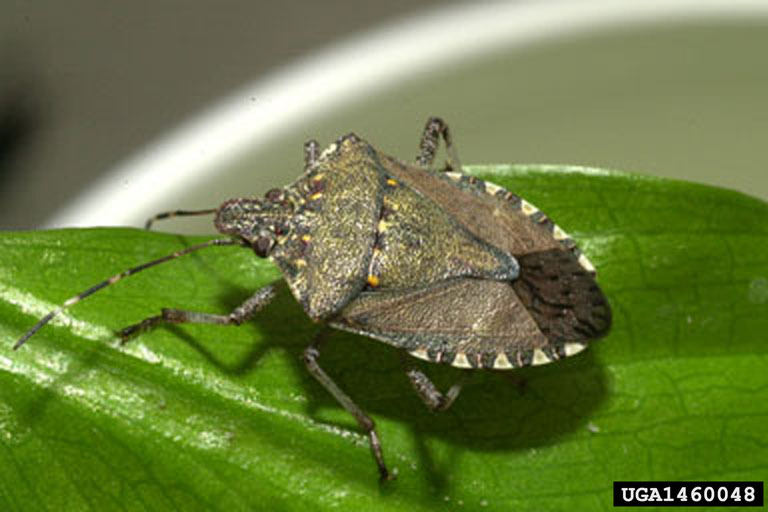 On BugGuide.net, sightings has been reported as far north as Rhode Island and New Jersey and west to Illinois and Nebraska. But I have seen more ground wasps, too. It’s possible that our female is simply following her offsprings’ food source, the ground nesting cicada wasp whose painful sting I have experienced. 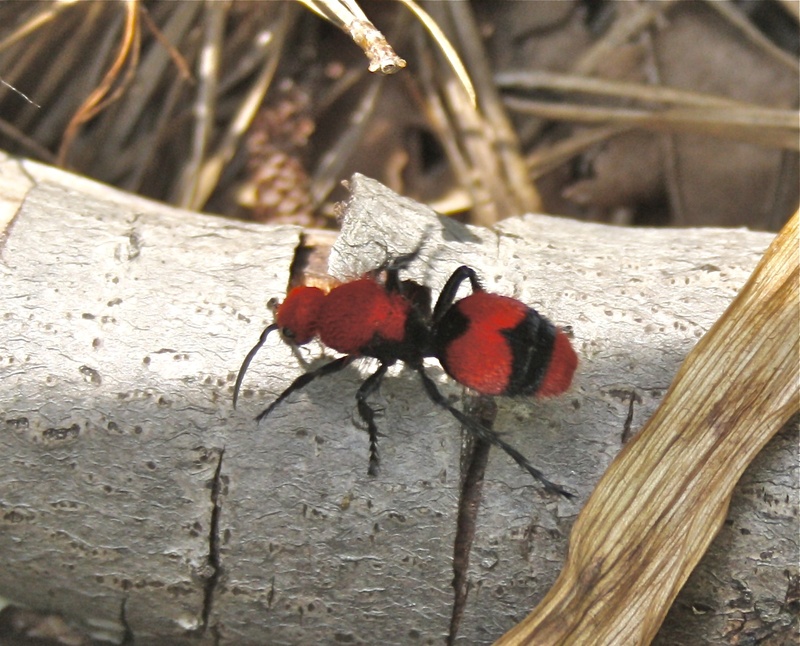 Without the solitary Red Velvet Ant, perhaps we would have an overabundance of those other stinging insects. I’d like to believe she is helping to balance the wasp and bee population and I’ll allow her to go on her way. 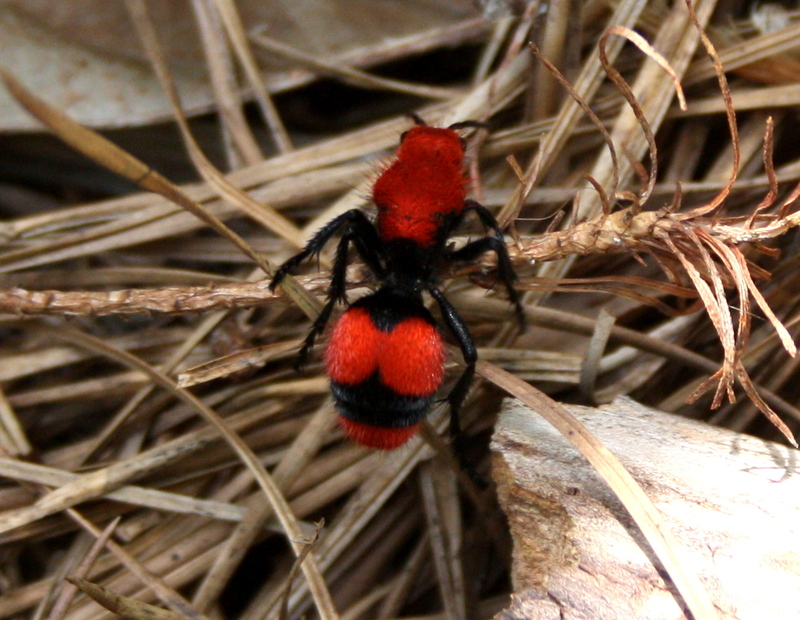 Check out the first Red Velvet Ant I saw. Tobacco Hornworm, a thing of wonder! It was three weeks ago that I first noticed the bare tips on a branch of a tomato plant in my small kitchen garden. I looked beneath the plant and saw some telltale caterpillar poo and I knew what was hiding on the under the leaves of my plant. I carefully lifted branch after branch until I found it… a tobacco hornworm caterpillar, the larva of the sphinx moth. It was a gorgeous 4” long pale green caterpillar with 5 pairs of prolegs and 7 white diagonal stripes on the sides of the body and a red-colored horn on the last segment. It’s closely related to and often confused with the tomato hornworm caterpillar with similar markings but the red horn is a good identifying feature. I’ve read that tobacco hornworm is more prevalent in the southern United States and the tomato hornworm is found more in the northern states. 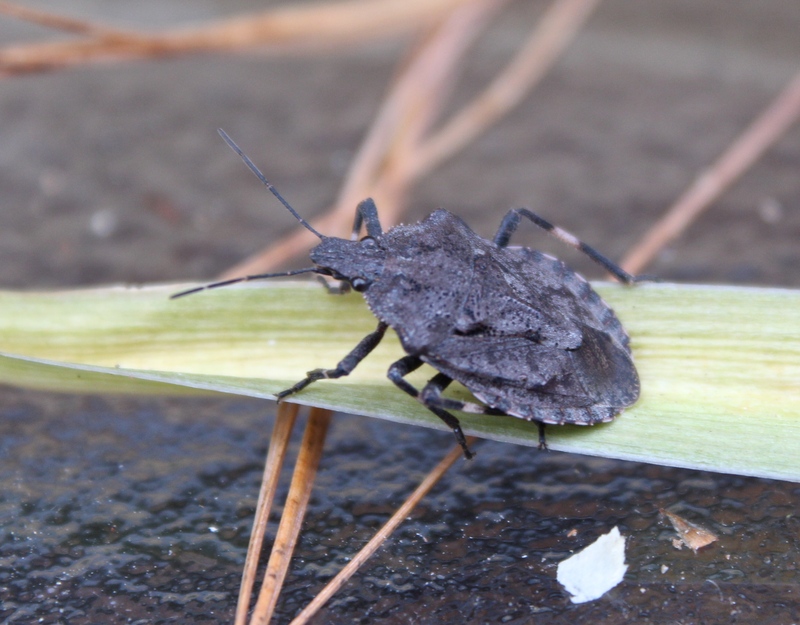 Both feed on plants in the nightshade family: tomato and tobacco and others such as potato, pepper or eggplant and these guys can wreak havoc in the garden and can cause extensive damage to plants. My big fellow had eaten 2 small unripe tomatoes and leaves on one small branch, however he was working alone and soon to enter the pupate stage so I left it on the plant. Some natural bug deterrents are said to be red pepper sprinkled on the plants or a mixture of water, vegetable oil, and dish soap to repel them. 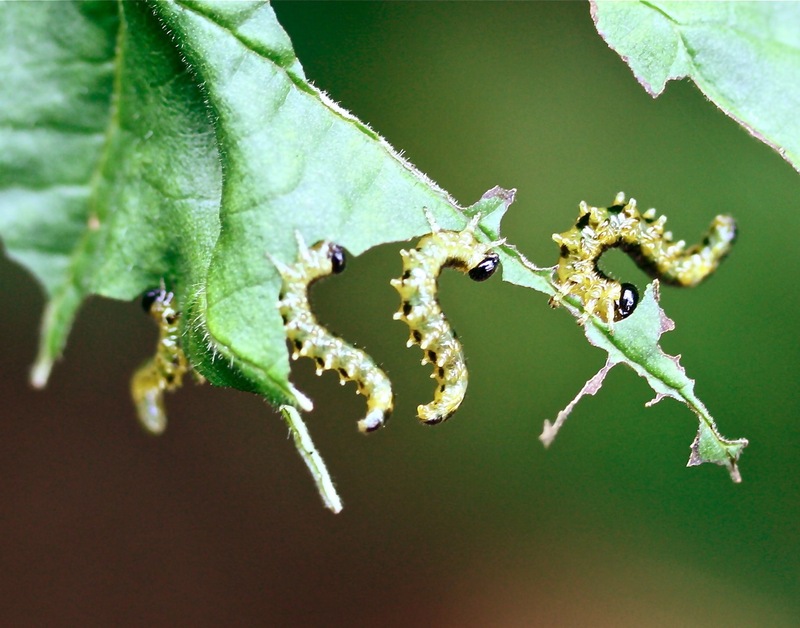 Handpicking is an effective control in small gardens but one of the most common biological controls for the hornworm is the parasitic braconid wasp that lays its eggs inside the body of the caterpillar. After hatching they bore through the skin of the caterpillar and attach white cocoons along the body. If you see one with the cocoons attached, do not kill the hornworm as the wasp will do the job. 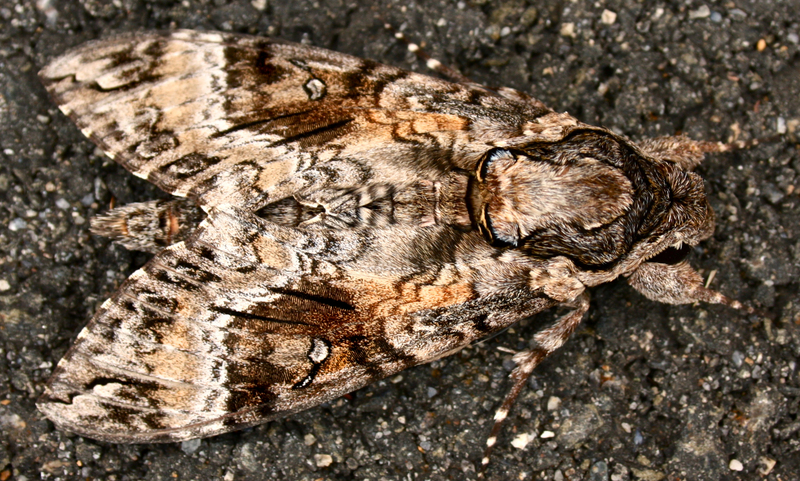 The large adult sphinx moth or hawkmoth is seen around flowers in my garden at dusk or dawn. They are as graceful and agile as a hummingbird as they hover over blooms and flit quickly from flower to flower. It’s a shame that something so full of wonder can begin life as a such a destructive insect in our gardens.